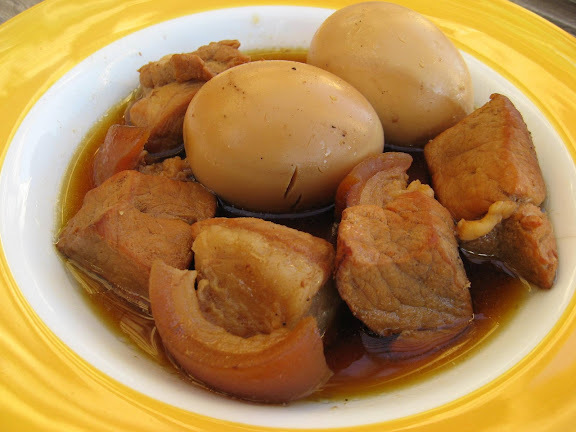 Thit Kho is a Vietnamese dish rarely found in restaurants, but served in all Vietnamese households. My grandma traditionally makes this dish with water rather than coconut juice, but my aunt likes the consistency the juice provides. Hard boil eggs and set aside. Cut pork into 1″ x 2″ pieces and set aside. In a thick-walled pot or dutch oven, add the sugar and stir until it melts. 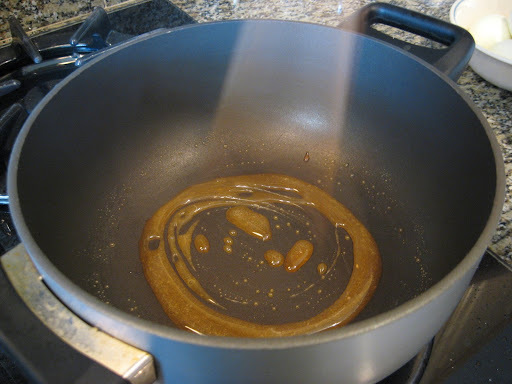 [You can add in a tablespoon of water to the sugar if you’re cautious about working with caramel.] Cook the sugar until it turns a deep golden hue. Add in the pork and cook for 3-5 minutes on medium-high heat until the meat is evenly coated with the caramel, but not cooked through. When the pork is evenly coated with caramel, add in the pepper and fish sauce. Turn the heat to low and stir the pork for 5 minutes to absorb the flavors. Add in the coconut juice and bring to a boil. Add the eggs to the pork mixture, cover and cook on medium heat for 35-45 minutes or longer for tenderer meat—make sure that the eggs and meat are submerged under the cooking liquid. Adjust the seasonings to taste before serving. Serve warm over white rice. i love this. my mom just made this for dinner tonight. but she always put ginger in it when she parboils the pork. it takes away some of the smell. this brings back glorious memories! to be honest the eggs are my favorite part of the whole dish… ok well no, besides the skin on the pork when its all said and done! i’m assuming you are using “teaspoons” of sugar? and do you mean coconut water, milk, or ??? I’ve been trying to find a good recipe for this. My grandma never taught me how to make it, and now that I’ve moved away, I’m always craving it. I just learned that when you make it with the larger cuts of meat, it’s southern. 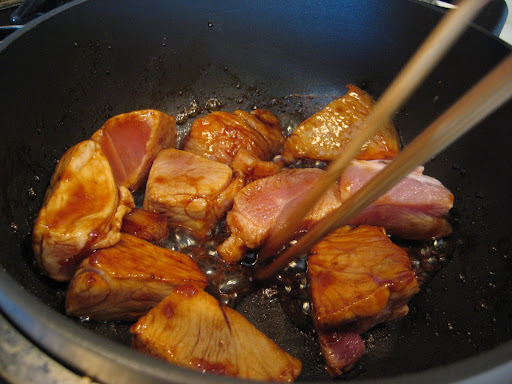 If you use smaller 1/2 inch strips of pork belly and the sauce is thicker, more caramalized, it’s considered northern. coconut juice, usually found in a soda can in asian grocery stores, or water can be used. do not use coconut milk. tran — this recipe is delicious. please give it a try! yen — interesting fact. my family is from the south and yet our thit kho preparations are more northern. 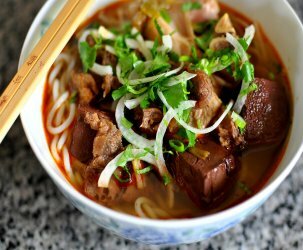 Every woman in my family has “độc chiêu” dish – sort of a killer dish. 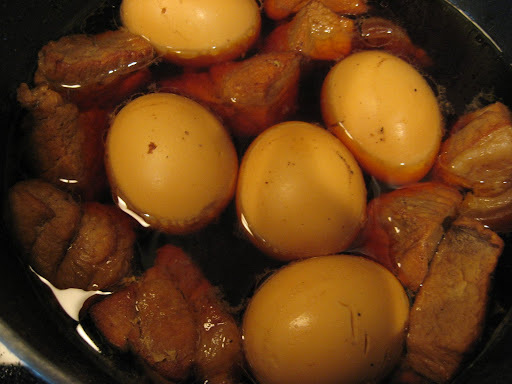 Thit Kho (Thịt Kho) is my sister’s “độc chiêu”. My Mother showed me how to make this dish. You don’t even have to caramelize the sugar. 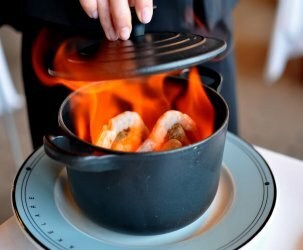 All you have to do is cook it at a low temperature until the liquid reduces and it magically turns color. i think adding caramelized sugar helps enrich the taste of sauce. i love this dish especially the eggs. btw, you can buy this at vietnamese deli. here in northern virginia, you can buy already made dishes very cheaply. Yes that’s my real name. My sisters and I used to beg her to make it.I’m actually making this tonight.My husband is american.He says he hates the smell,but he too always begs me to make it.It is sooo good,and brings back good memories. I just went over my comment.Sorry,”her” is my mother. ADD canned quail eggs instead.. You can find them at the asian grocery stores. DELICIOUS!! thank you for this! great stuff! Yes I love this dish sooo much . The best part is the eggs. I like the eggs so much that I made this dish only with eggs and it tasted so delicious . If you ‘re so concerned with fat, you can skip the pork or substitute the pork with chicken meat. the eggs are definitely the best part of this dish. i’m not a big fan of piggy meat so i usually just chuck a couple of the eggs in a bowl of rice, pour the sauce in and mix. pure heaven. Did anyone else eat this with boiled cabbage growing up? With the liquid you boiled the cabbage in, and rice, it is still one of my favorite meals. The cabbage eaten with the eggs and sauce is just perfect. I forgot about the boiled cabbage!! I am making Thit Kho right now and was wondering how to add complementary veggies to the meal without having to run to the grocery store. Glad I still have some cabbage in the fridge. Thanks for jogging my memory! are you guys sure this is the exact way to make it? does anyone else have a recipee on making this? My mom makes this too! It is so delicious. I am Filipina, and I had a Vietnamese roommate in college. She would share her mom’s home-cooked dishes with me. I remember eating this dish. 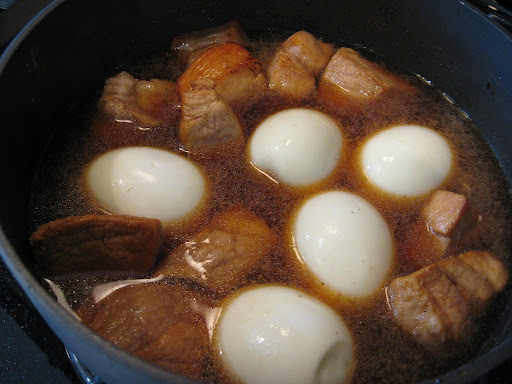 It reminded me of Filipino adobo with hard boiled egg. This was good stuff. My mom usually makes it with coconut soda, from the green can. Also, we eat it with spicy pickled mustard greens. Sooo good!! Sometimes people also deep fry the hardboiled eggs first to add an interesting texture. You can also use seven-up, in lieu of coconut juice. Just reduce 1.5 spoon of sugar down to .50. The best veggie for this dish is “quick pickle bean sprout with carrot julienne and chinesse chive” or boiled on-choy (rau muong luoc). Slitting the hard boiled eggs also prevent them from hardened after reheating multiple times. This only applies if you make a big pot of “thit kho trung” and plan to eat it for several days in a row. I tried this, but the flavor of the egg just doesn’t come out right. I’ve had it where the flavor is infused within the hard boiled egg, almost like it’s been marinated over night. How do you achieve that? I DONT EAT PORK BABY SO WHAT MEAT CAN BE SUBSTITUTED FOR PORK. hi. 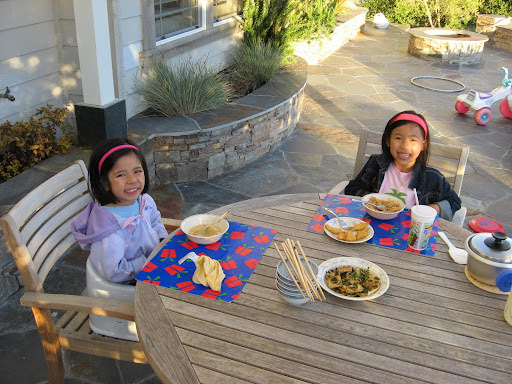 the kids in the picture are my sister,madison,and I. my mom was cooking when you took a picture of this. You should caramelising the eggs too – just chuck them in with the pork, adds a bit more flavour to the eggs as well as giving the skin a bit of texture. You should try it – add a bit of water and a bit of Coca Cola once the meat / eggs have been caramelised. 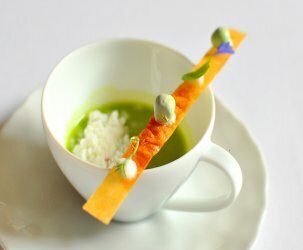 It’ll add to the sweetness and colour, and in my opinion balances the dish rather well. You won’t have to use soya sauce to give it a dark colour too. I do prefer the other version of this dish (thin sliced pork belly) though, caramelized with shelled prawns and eaten with fresh piping hot steamed rice – now that’s comfort food! I never tire of this version, I can eat it for days. I usually slice up the belly pork and marinade it with fish sauce, ginger, finely chopped chilli and sugar before following the above steps. Also, in this version of the dish you shouldn’t add any coconut juice to it, but you should add a bit of water however. It should also be mention that you can do this with fish as well, Ca Kho – which too is awesome. Don’t ask what fish to use as I’ve only just mastered the pork varieties and haven’t advanced to Ca Kho as yet. – chicken; use plenty of finely chopped chilli and ginger – vital! My friend taught me this recipe using pork belly, a block of brown sugar, teaspoon of peppercorns + a few garlic cloves, whole chillies & the fish sauce to taste. Turned out exactly like how both my grandmothers & mum makes it. Just made this today & dad said it is just as good as my mum’s! My mom sometimes makes it with salmon as a substitute for one or the other. chunk or cube….same size as meat………taste delicious!! The perfect side for this is watermelon! Delicious together. Thanks for great recipe. I am trying to learn how to cook vietnamese food for my fiance.. I am so excited to have found this recipe! I am making it tonight and i can’t wait! Will let you know how it turns out! Thank you! Help!! This is my first attempt at making this dish, and it turned out too sweet. Almost no savory at all and is a strange combination with the pork 🙁 Is there a way to salvage it? thanks!! 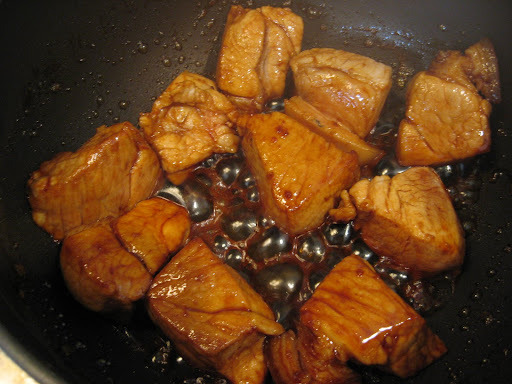 Sara – A combination of salt and fish sauce will save your thit kho. Season to taste.